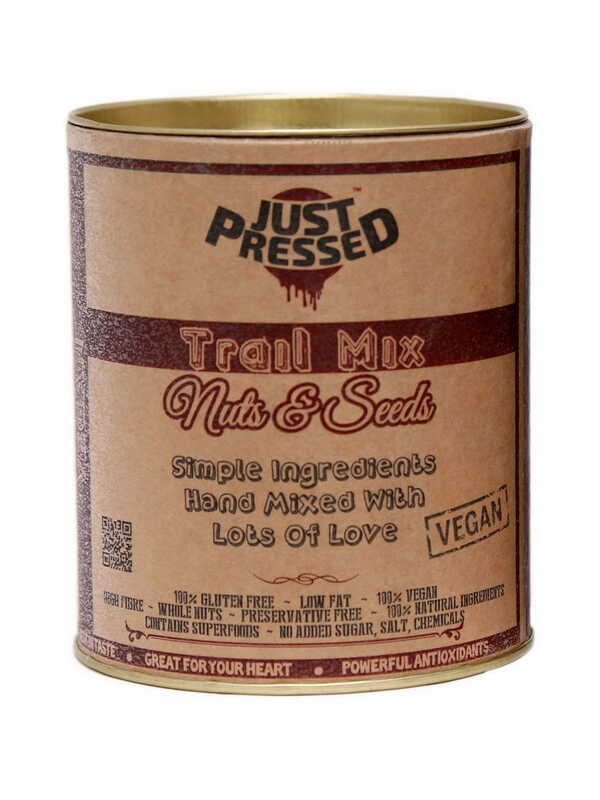 Top notch nuts and essential seeds for the ingredients for this wonderful product which we present before you. JustPressed™ Nuts & Seeds Trail Mix has an addictive taste, which you might expect from a snack, but it is so healthy that you need not feel guilty of eating it as much as you can! Whenever you are feeling low and weak, just pop a few nuts and seeds from the container which is so easy to carry that you can practically take it anywhere with you- school, hiking, gym or even to your workplace! There is absolutely no added sugar, salt, chemical or any kind of preservative added to this product in an effort to bring to you nature’s goodness in exactly the same form in which nature intended it to be! So you can savor its magical taste without worrying about the amount of harmful chemicals going inside your body. Sounds too good to be true? The best is yet to come because this product can be bought online from FoodFeasta.com and it will be sent directly to your home! So order now! Ingredients Peanut - cashew - walnut - pistachio - flax - pumpkin - seasame - chia - sunflower seeds.